Nothing like an easy, healthy casserole recipe to make a hectic weekday a bit easier! 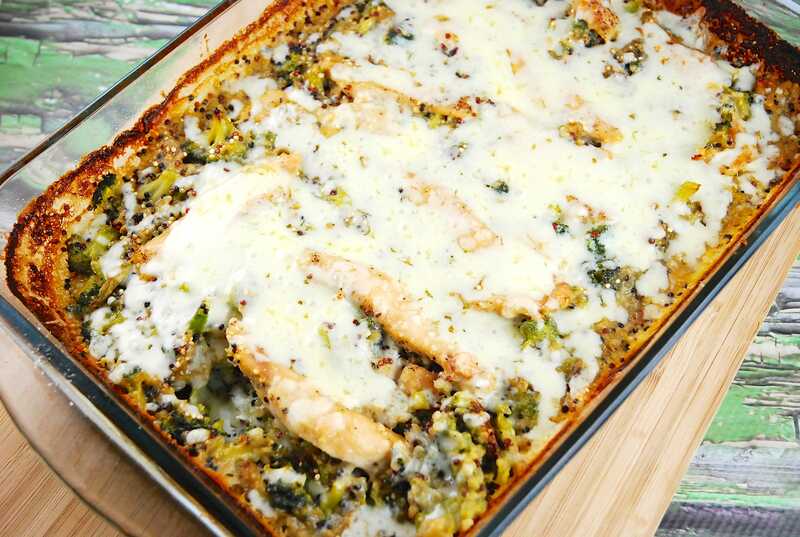 I recently came across the original version of this Chicken, Broccoli, Quinoa Casserole Recipe at Pinch of Yum, and I thought it was a fantastic twist on a traditional broccoli chicken and rice casserole, so I was excited to give it a try. A few minor alterations and the casserole was extraordinary! It tastes amazing, was very filling, and satisfied the whole family. And with all of its amazing healthy ingredients, I don’t feel the need to make any extra side dishes. Yay for less cooking! This is an amazing Weight Watchers casserole recipe that I will be making again and again. Creamy, comforting and divine, this Weight Watchers casserole recipe is as healthy as it is delicious. Full of protein and fiber, it’s very satisfying, and makes a wonderful all-on-one meal. Preheat oven to 400 degrees. Generously mist a 9 x 13 baking dish with nonfat cooking spray. Place a medium sized saucepan over medium high heat, and pour in 2 cups of the broth and 1/2 cup milk. Bring to a boil, then whisk in the flour, poultry seasoning and remaining 1/2 cup milk. Whisk well until the sauce is creamy and smooth. Season with salt and pepper as desired. Pour into a large bowl. To the large bowl of sauce, add remaining 1 cup broth and quinoa, and mix well. Place broccoli florets evenly into baking dish, pour quinoa and sauce mixture over the broccoli. Season chicken strips with salt and pepper and lay them evenly over top of the casserole. Cover with foil, and bake for about 30 minutes. Remove from oven and stir around a bit. Return to oven, uncovered this time, and bake for another 10-12 minutes or until chicken is golden brown, and quinoa grains are cooked and tender. Remove from oven and top with the mozzarella cheese. Bake for another 5 minutes or until the cheese is melted and bubbly. Let cool for 5 minutes before serving. I’ve made this recipe at least 10 times. I use frozen broccoli and it still turns our awesome. It’s so yummy! Unfortunately, my daughter and boyfriend don’t like it, so I just eat it as lunch throughout the week. I never get tired of it. Made this last night, didn’t change a thing and it was wonderful. Put three servings in the freezer and I hope it reheats okay, has anyone had success with that? Is the chicken supposed to be uncooked when you lay it in the dish? Yes. The chicken will cook in the oven. I made this about a month ago and it was a big hit! Meanwhile, house-members have turned vegetarian and dairy-free… *sigh*..
and maybe an idea for something instead of chicken? Sounds like a nice recipe. Maybe I missed it somewhere in your recipe, but I couldn’t figure out where to add the cheese so I didn’t make it. Do I cook the chicken first? No, you just put it on the top of the casserole raw and it cooks as the quinoa and broccoli cooks. This was soooo good! I’ve never really cooked with Quinoa before and I wasn’t disappointed! My husband couldn’t stop talking about how good it was! It’s going to be a weekly staple. I made this last night and it was fabulous!! The only thing i did different was i cooked down some onions in the sauce pan before i added the other ingredients. Thanks for all the great recipes! I made this – it is incredible! iv been eating off it all week, i make a side salad to go with it, and im like SO FULL after a serving + salad. Next time I think i’ll add purple onion, it would compliment it nicely! thanks for the great recipe!